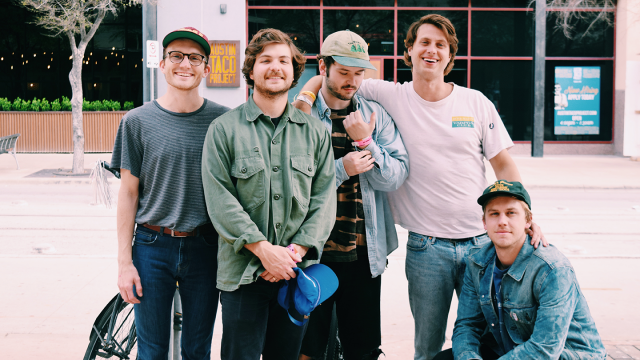 SXSWfm interviewed the up-and-coming Austin indie rock band Duncan Fellows during the week of SXSW 2018. Sitting on the floor of the Austin Convention Center, Cullen, Colin, Jack, David, and Tim discussed writing their latest album, Both Sides of the Ceiling, being KUTX Artist of the Month, and their love for writing sad songs. Read an excerpt of the interview below, and listen to it in full on our Mixcloud. How many times have you played [SXSW]? Cullen: You know, that’s an interesting question. One time officially. We’ve done a few SX’s though – I think three, maybe four. Why was playing at SX so important? Cullen: I think it’s a really big deal for us because we’ve been going to it for so long, so we’ve been in the mix and a part of it. So it’s a cool privilege to get to do it officially. It’s crazy – there’s a lot of people, man. I know everyone asks you this question, but just for our listeners, how did you guys meet? Cullen: We met at a house on Duncan Lane that I was living at… We came together because my buddy Topher and I had played a support show with this dude and we got another show from that at Red Eyed Fly and were like “we should make a band and just put on a show here.” So we hit up Colin, Tim, and a few other people that, R.I.P., are no longer with us, and we kept hanging out from there. You guys have been killing it here in Austin, you’ve also been added to two [officially curated] Spotify playlists. How does it feel to be receiving so much praise about your [recent] release? Jack: Feels great – we need the validation. Cullen: It’s absolutely incredible. It’s cool that it gets shared, and people who don’t live here in Austin and come to shows, that they can hear it and hopefully enjoy it or connect in whatever way they do. Colin: It’s really cool to have emotionally connect with something that you have emotionally connected with as well when you’re creating it. There were three girls who came to our show this morning [at 7am]… and they love Duncan Fellows and love all the music, and it’s always really cool. Did you think “Fresh Squeezed” would be the one to take to these places? Cullen: Originally it was going to be “Rosalyn” that was going to take us to these places… but I sent it over to [my sister] and she works over at a label called Ninja Tune…Her and all her friends were like “it should be ‘Fresh Squeezed.’ ‘Rosalyn’s’ cool but that’s not a single song.” So we bit the bullet and they were right, so it was good. We just wanted to release sad songs. Colin: Like Cullen just mentioned, the writing process was a little different on [“Fresh Squeezed”]. We usually lean toward sad songs, I would say. It was originally something different entirely, but we weren’t jiving with that so we were like “well, we should just write about our immediate environment – what we see around us. Which was a gross house, eggs, OJ. It flirts with deeper contexts as well. You guys have been recently posting some photos of y’all back in the studio. Are you guys teasing us for some new music? Cullen: We’re trying! It’s a process. We went out a recorded a bunch of demos a couple weeks ago, but it’s just something that, until we are happy with it, we will just keep working at. We’ve been playing so many live shows lately that it’s hard to get yourself in that space and have enough time all together to really be happy with what you’re doing. So right now it’s just parsing out ideas – hopefully in a few months. Jack: The short answer is we are writing. Don’t have a date on songs and we probably won’t for a minute. But we’re writing them. Well then what’s next…is there a tour planned? Colin: We are finishing SXSW, and then I think we are trying to write is the main thing. No big tours planned. I think we’ll play some shows here and there…we’ve just been so busy because we did our residency at Cheer Up Charlies in February, so every Monday we played there. And then all of the SXSW stuff. So I am looking forward to just chilling for a bit and trying to write some new music and see what happens with that. We want to get back in the studio to explore and write. Tune in to hear the full interview with Duncan Fellows below. Keep checking our Mixcloud page in the coming weeks as more interviews with 2018 SXSW Showcasing Artists are released. You can listen to SXSWfm 24/7 via our online player.